VANCOUVER — Like it or not, it seems, the area along 179th Street near the Clark County Fairgrounds will be the region’s next major growth center. Last year the members of the Clark County Council voted to lift urban holding on 40 acres just northeast of 10th Avenue and 179th. The property, owned by Lance Killian, is eventually expected to see a build-out of 200 single-family homes, and a 326-unit apartment complex. Next month, the council could also decide whether to lift urban holding on a 147-acre parcel near 179th and 50th Avenue, owned by Holt Homes. Phase one of that project could bring another 606 single-family homes and 99 townhomes to the area. That’s a small piece of what the eventual future of the area is expected to be. According to a report done for the county by E.D. Hovee and Company, the entire 179th Street/I-5 development area covers 5,300 acres, 2,100 of which is currently within the last remaining urban holding area within the urban growth boundary of the city of Vancouver. The Clark County Vacant Buildable Lands model shows slightly more than 1,100 acres of that area is potentially developable. The Hovee report says that room could bring around 7,600 new jobs to the county, 5,650 new housing units, $2.9 billion in construction revenue, and $34 million in ongoing annual tax revenue. The county expects the cost of those improvements to be around $66 million. While much of that is currently funded through existing road funds, grants, and other funding, the current estimate is that $19.1 million is still unfunded. Unless the county can show “reasonable funding” for those traffic improvements, state law does not allow urban holding to be lifted. 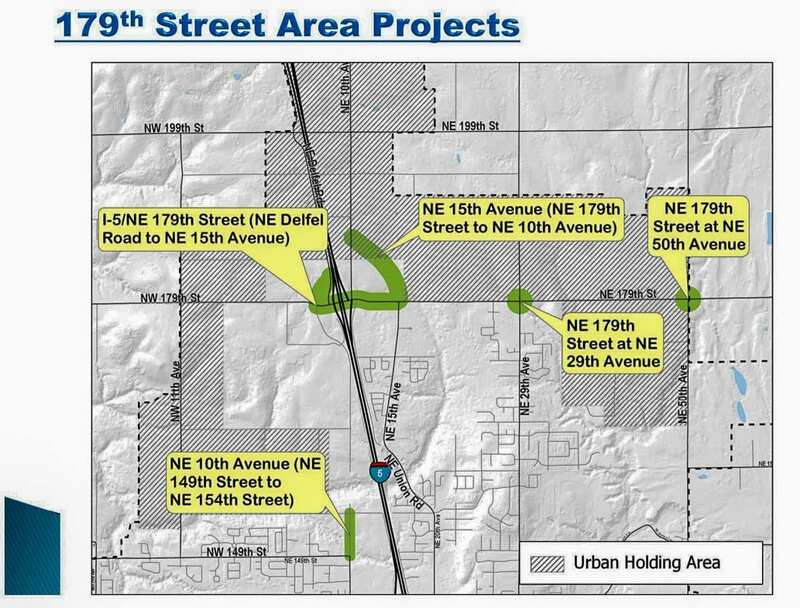 Earlier this year the I-5/NE 179th Street Transportation Area Committee presented a number of options to the council to raise the additional funding. Developers agreements are currently being worked out, and the county hopes those will address around $6.8 million of the cost. The remaining $12.3 million would come from a mix of developer surcharges, Traffic Impact Fees (TIF), and tax increases. The county voted last year to take a one percent increase in both the property tax levy, and the road fund. They still have banked capacity of 2.17 percent in the general fund levy, and up to 4.23 percent in the road fund. At the high end of the scale, tax increases could represent up to $21.15 per year for a median house, although it’s unlikely the council would vote to approve that. At present, it appears the council is leaning towards option 1, which would approve using the banked road fund capacity increase and bonding around $5.13 million to be paid back through a mix of developer surcharges and additional TIF costs through an overlay. That last part is somewhat controversial because the Mount Vista TIF area is already the highest in the county at $577 per trip generated. 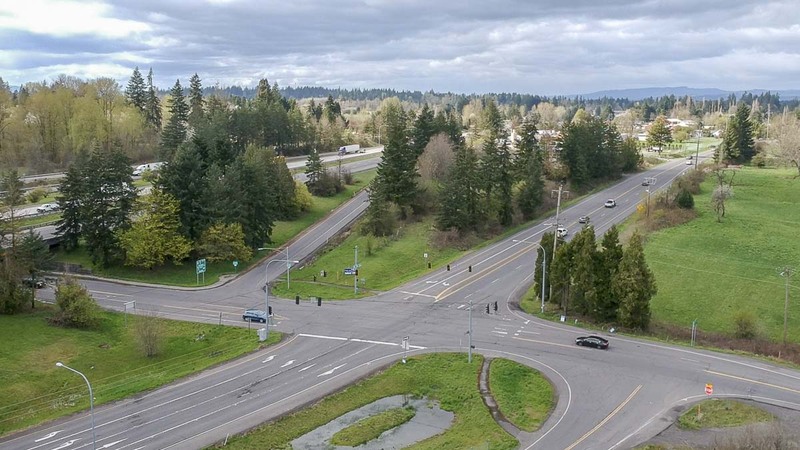 At its council time meeting this week, members appeared ready to move ahead with a public hearing on the I-5/179th Street improvements as soon as May 7. Councilor John Blom said he felt giving the public so many options might be confusing, but Quiring responded she felt the public was smart enough to figure it out. The idea of lifting urban holding and developing the 179th area has long been a goal of the county. So why has this council made it a priority to get done in 2019? The 179th/I-5 interchange remains the only unimproved freeway exchange in Clark County. Built in the 1960’s, it lacks the capacity for even a fraction of the future growth anticipated in the area. In 2016, the state legislature approved $50 million for an upgraded intersection, but the funding doesn’t come available until 2023. Efforts, thus far, to bump up the timeline of that funding have failed. 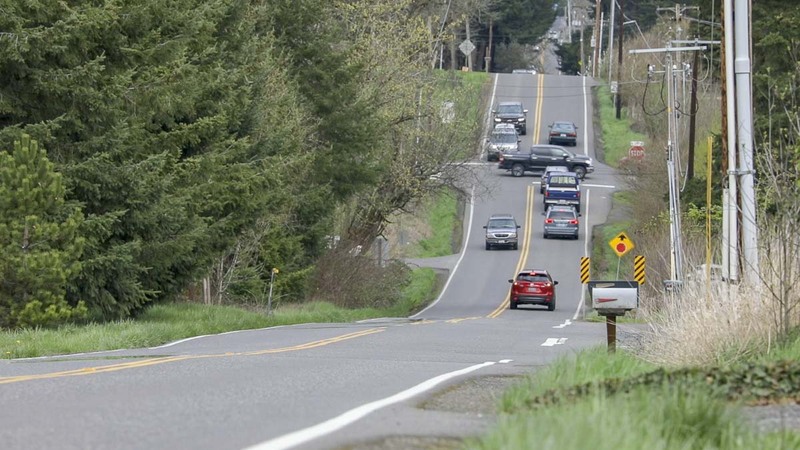 Last year, the legislature did approve $500,000 for Washington State Department of Transportation (WSDOT) to continue planning work in the area. The hope is that, should efforts to get funding in 2021 instead of 2023 fail, WSDOT and the county would be ready to start construction sooner than the current 2025 projection. So the urgency now is that, if the county is successful in bumping funding on the freeway interchange project up a couple of years, they would be able to have local street improvements finished just before WSDOT breaks ground on the new interchange. While most of the talk from neighbors who live near where all of this development will be going on is centered on the number of new houses, Henessee says he’s much more keen to see commercial development in that part of the county. “I want to get as much commercial as we can because, really, commercial is what pays the bills,” he says, noting that residential brings in property taxes, but commercial brings in both property and sales taxes. Still, Henessee admits that housing growth is a key element in any area’s economic vitality. A larger population attracts more employers and businesses which, in turn, attracts more people. That means more options for residents to spend their money, and more tax dollars not going into tax-free Oregon. “As we get larger in residential, particularly if tolling goes into place on the bridges, that’s going to be even more ‘do I really want to go face the traffic and pay a toll to go over there to go to dinner?’” says Henessee. But, of course, none of that matters if traffic in Clark County gets as bad as it is in Multnomah County. Hence the pressing need to address capacity concerns before development really gets underway in the 179th Street area. 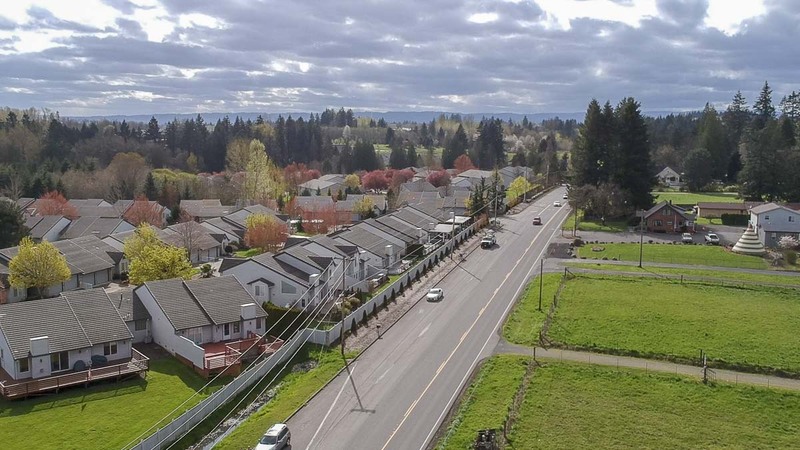 As previously mentioned, the county council expects to hold a public hearing at their May 7 meeting about both the I-5/179th Street improvement funding options, and the plan to lift urban holding on the Holt Homes property ahead of that. There are still some questions to be answered. Councilor Julie Olson brought one of them up toward the end of Wednesday’s council time meeting. “Why would we go through the process of ‘reasonably funded’ if we’re not going to lift this whole piece?” asked Quiring. Cook said she will try to have an answer for the council in time for the public hearing on May 7.